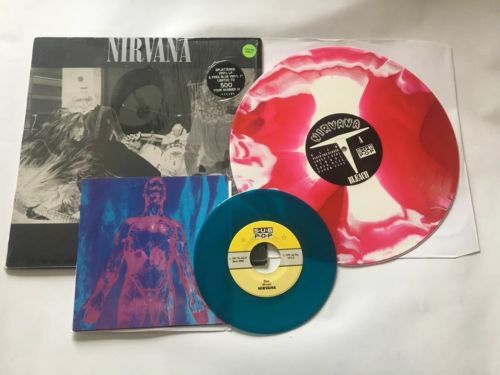 Nirvana Bleach US 12” Red and White Swirled vinyl. Nirvana Bleach US 12” Red & White Swirled vinyl. Sub Pop Erika 3rd pressing SP34. limited to 500 copies and individually numbered. This is number 498/500. Includes Erika pressing of Sliver on 7” blue vinyl. One of the most desirable Nirvana collectibles. This copy is still in the original shrink with stickers attached but has been opened.